The Department of Management hosted a panel for students on April 27 in Morris Library. 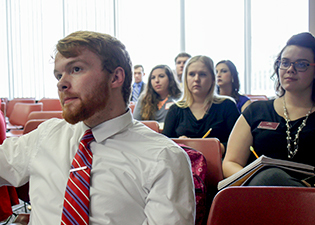 Nearly 100 students attended one of the two panel sessions. Jennifer Olson, loan officer and vice president of Farmers State Bank. Richard Brodkorb, president and principal consultant with REB Management Co.
Lily Sugathan, accountant at Martz & Wilson LLP. Penny Clancy, vice president of human resources, Sentinel Technologies Inc.
Herby Voss, director of marketing, public relations and business development for Heartland Regional Medical Center. Pete Mykytyn, department chair and professor of management, played a big role in making the management panel possible for students. Would you recommend getting an advanced degree right away after getting a bachelor’s degree, or gain experience before returning to school? What is your recommendation regarding obtaining an advanced degree or some kind of certification? What are the factors you should consider when selecting your first job? Should money be the most important criterion, or should it be another factor such as promotion, personal growth, benefits, peer recognition, sense of pride (accomplishment) and sense of team (helping others)? What good or bad advice have you received? What should a new hire do to be successful in his or her first career position? What did you learn from your first job experience? What were your biggest risks you have taken in your career? What are challenges to overcome? Abigail Meyers, a senior studying management with a specialization in personnel/human resource management, attended the panel and shared her experience. Austin Mallow, a senior studying management with a concentration in entrepreneurship and a minor in finance, also attended the event. Kaitlyn Kern, a senior studying business management with a specialization in health-care enterprises and a minor in health care management, also attended the event. “From the panel, I gained a lot of knowledge I had not previously known,” Kern said. “The panel I attended had three board members with diverse work experience. It was interesting to hear about their journeys, along with their struggles that may be similar to the ones I soon may be faced with in the upcoming months. Since they all had vastly different careers, it allowed for questions to be targeted toward a specific panelist or to all of them, allowing different viewpoints based on their personal experiences. Each gave a different take on topics ranging from graduate school, internships, interviews, and getting your first job. Marshon Tucker also attended the event. He is a senior studying business management with a specialization in entrepreneurship. “At first, I didn’t expect the panel to be so down-to-earth and relatable,” Tucker said. “Richard Brodkorb, Lily Sugathan and Jennifer Olson all brought something to the table that I could relate to. Richard discussed the importance of critical thinking, and how adding value to yourself can give you a competitive advantage. I use my critical thinking skills on a regular basis for problem solving or decision-making purposes. If I am not in class learning, I tend to read the news articles from Bloomberg and CNBC, or watch podcasts on entrepreneurship and self-development. “The one panelist that I could relate to the most would be Jenifer Olson,” Tucker said. “Jennifer explained how she could never get a job by sending in her cover letter and résumé. Whenever she would receive a job opportunity, it would be because of someone she knew personally. Jennifer let her hard work, dedication and personal connections speak for her when a résumé couldn’t. William Schefelbein, a junior studying management, also attended the event. The management panel takes place every spring. Watch for information or talk to your professors to get involved next year.